Before restoring a painting, in order to assure a good level of adhesion between the canvas and the preparation layer or to reline the painting, it is often necessary to consolidate the canvas by intervening on the painting rear. Traditional cleaning techniques, chemical combined with mechanical ones, show an important drawback: The cleaning process and technique enfeeble permanently the canvas. 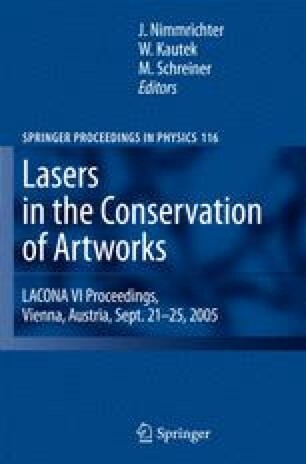 The present work performs a comparative study for evaluating both the cleaning process efficiency and the canvas integrity preservation by using various cleaning methods, including Nd:YAG laser systems and traditional techniques. The effects of a short free running mode (λ = 1,064 nm, pulse duration of 40–110 μs), a long Q-switched mode (λ = 1, 064 nm, pulse duration of 200 ns) and a Q-switched mode (λ = 1,064 and 532 nm, pulse duration of 6 ns) of Nd:YAG laser irradiation on the hemp canvas of a seventeenth century painting are investigated. The analyses using FTIR spectroscopy and degradation mapping by optical microscope, with photographs taken before, during and after the cleaning process, were carried out. The work is still in progress.